Hot Door CADtools 11.1.1 – CAD drawing and technical Illustrator plug-in. CADtools is a complete technical illustration solution for Adobe Illustrator CS5, CS6, CC, and CC 2017. 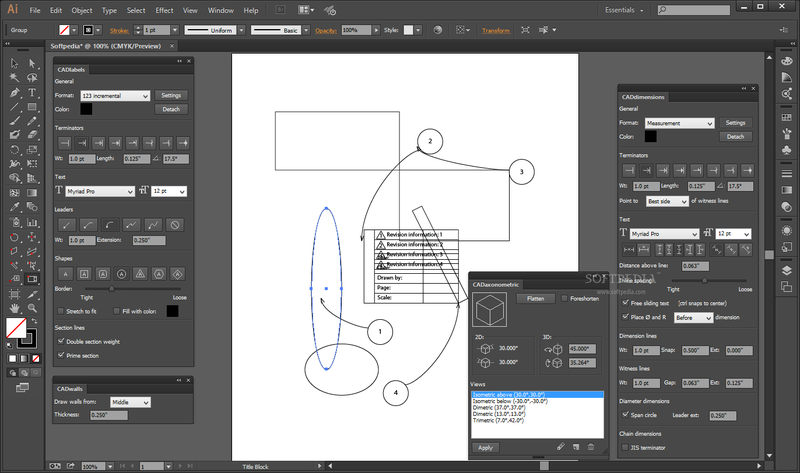 CADtools allows users to draw, edit, and dimension objects in scale within Illustrator, with 11 panels and 81 drawing, editing, dimensioning, construction, and labeling tools. The CADtools plug-in mimics Illustrator’s tool behavior for designers seeking a creative, easy-to-use alternative to complex CAD applications. CADtools 11 unveils new productivity power with new features that simplify tasks and save time. The spectacular Universal Dimension tool pulls out horizontal, vertical, and axonometric lines, circles, and labels without changing tools. The Bézier Length Dimension tool measures complex paths and arcs. In Illustrator’s Select menu, new choices quickly select CADtools dimensions, labels, or attached artwork. Smart keyboard input while dragging (supported in Illustrator CS6 or later) provides instant editing of dimensions, labels, doors and windows, polygons, and rounded rectangles. The new CADrepeat panel offers the duplication of objects in a linear, grid, or radial path. Compact fractions, filled label shapes, and dimension line extension options present the beauty in details celebrated with CADtools. Next story Pacifist 3.6 – Install individual files from .pkg installers and more. Previous story AutoMounter 1.5.6 – Automatically mount network shares. ArchiCAD 22.0.0.4005 – Premier BIM solution for architects. CorelCAD 2015.5 – Reasonably-priced CAD solution.